For some time now this blog has been presenting the Way of the Unborn through different modalities: Within Yogic parameters the The Yogasūtras of Patañjali and The Bhagavad Gita portray the ascetical discipline necessary in which to put to rest the appetite for carnal things within which the Unborn can be approached freely and unobstructed. The Lankavatarian Book of the Dead, The Tathāgatagarbhatārā Tantra, and Notes from the Iron Stupa comprises a Tantric Trilogy which encompasses Atiyoga, Mahayoga, and Anuyoga all highlighting elements of Sacred Tantra, the Bardo Realms, and even Shamanistic components that altogether constitute transcending the skandhic potpourri and stimulating the direct Primordial Ascendency of the Unborn. 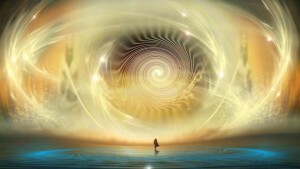 This past Spring’s, The Secret Golden Light of the Unborn, highlighted the Golden Spiritual Elixir of the Unborn as its channeled through the chakras with the Great Turn-About in the inner depths of consciousness in order to discover that Golden-Thread, which if faithfully followed, would lead one back to their True Primordial Home. With the recent conclusion of the Unborn I Ching series we explored certain Divine-aspects of Divination, which accompanied by an earlier sister series that also highlighted aspects of divination that was nuanced with Tozen’s splendid early teachings on the Unborn, The Dragon Mind of Zen Tarot. Indeed, divination if approached from a transcendent angle accompanied with Right Gnosis reveals how the abiding primordial functions of the Unborn can be a constant companion and mentor on the spiritual journey. Another element that the Unborn I Ching series expounded upon was the further extension and exposition of the fourth constituent of the Noble Truths. As one progresses on the Noble Road to Self-realization it becomes evident that they go beyond the standardized “Eight-fold Path”—which was meant for novices in order for the early development of a sound foundation—as there are a vast array of Noble Truths (beginning with the Bodhisattva path) revealed when the adept matures in the further unfoldment of the Buddhadharma. Along with Right Conduct would eventually come Right Discernment and even Right Analysis; for our upcoming series the emphasis is on Right Contemplation. Doctrinal series like The Awakening of Faith and The True Lion’s Roar of Queen Śrīmālā depict sound Mahayana Principles that highlight the unique position of the Unborn in terms of Tathagata-garbha formulations. Of course, our numerous series on pertinent sutras also contribute to principles that pertain to the Unborn. Tozen’s marvelous Tozen Teachings empower the adept to attune to the Way of the Unborn in his own singular fashion. The high order of Infused Contemplation means being stripped naked of all phenomena and what is left is the all-piercing awareness of the Absolute AS Absolute—undivided and devoid of all secondary characteristics. Traditionally, an eremitical-monastic lifestyle is the best venue in which to partake of this contemplative sweetness, unhurried as it is with temporal concerns and the incessant onslaught of defiled sensate phenomena. It provides the perfect solitude in which the contemplative best encounters the Unborn AS IT IS in ITSELF. It’s a transcendental union with the best of all primordial unions that are in direct contradistinction to an alienated world environment. The primary factor to consider here is that of ascesis, or the deafening silence and solitude that are part and parcel of the spiritual discipline required in which to undertake such an audacious task. This is an apophatic way as opposed to a kataphatic discipline—a total darkness and negation of a sensate world in favor of a naked emptiness of spirit. Yea, there comes a point wherein all “images” are insufficient to encounter THAT which is completely devoid of all outflows thus penetrating the Dark Principle through and through. In Absolute Contemplation the Unborn is experienced devoid of all conceptual constructs, in a total darkness that is beyond what the weary imagination attempts to fashion. The Actual Self can only be discerned in an intuitive darkness. Infused Contemplation is a passive one, devoid as it is of all action thus opening itself to the movement of the primordial spirit. It’s a self-emptying in order to be filled with the Absolute Fullness of the Unborn. Pure Contemplatives, therefore, live a life of total solitude in the dark silence of the Great Void that is devoid of all defiling characteristics. All former discursive meditations become insufficient, even a hindrance to direct and unadulterated union with the Unborn. Hence, the Unborn-ALONE is all that matters. While this is a darkness to our ordinary perception, it is a Total and vivifying Light for the Unborn. Wherein the Unborn issues forth a ray of darkness that is more splendid than the noonday sun. In a certain way, one becomes a contemplative when the Unborn discovers ITself in us. It’s a discovery of the direct-center of our True-Self. This Contemplation is alive in solitude but never in isolation as other sentient beings also share in this Noble Enterprise. One of the most important aspects of this divine infusion is the freedom to see the nature of Reality as it really is: Yathabhutam. The Buddha himself encourages one to come and see (ehipassiko) this Transcendent Realization in the depths of Contemplation’s Dark Night. It is only in this solitude that we can come to see things as they really are. This Real Recollection is essential for one who wants to lead a Contemplative Life. John of the Cross would add that an existential-freedom is also necessary in Contemplation, one that liberates one from the illusion of the false-self and Mara’s realm of unreality. Hence detachment from all desires, even spiritual ones, is essential for the quest of the Unborn; this also encompasses all intellectual concepts and all images—everything under the sun in the realm of sensate phenomena. All that is really required is a simple loving gaze into the heart of Suchness; nothing is really left of any significance but living free and unhindered in the Unborn. In order to have pleasure in everything Desire to have pleasure in nothing. In order to arrive at possessing everything Desire to possess nothing. In order to arrive at being everything Desire to be nothing. In order to arrive at knowing everything Desire to know nothing. This is renouncing literally “anything” that is less than full and unequivocal union with the Unborn. A complete “turn-about” from all forms of material and even spiritual satisfaction. All desire is killed-off, or as John would say the “darkening of all desire.” Right Discernment also comes into play. Guided by the Light of Discernment we are set-free from all desires that are not centered on the Unborn. This also empowers us to be capable of a gnosis that is serene and an undivided awareness power (Bodhi) that is incorruptible. This is freedom from all illusion that is attained through the discipline of Right Discernment. Firstly, one must properly discern when it is the right time to abandon all former discursive meditations. John of the Cross states that the first sign is when the adept’s meditations have reached an impasse; there is no longer any sense of fulfillment or growth in them. The second sign is a lack of all conceptual apparati that begin to impinge upon experiencing the Unborn as IT IS in Itself. He goes on to state that the third and surest sign that the adept takes pleasure in being entirely ‘Alone with the Unborn’, totally stripped of all former discursive meditations, just resting in peace and quietude. This is not a state of dull-passivity, but rather a very vivifying attentiveness in the Unborn. The Actual Self is the True Contemplative that renounces the illusory and seeks fulfillment solely in the Unborn. It is this interior dynamic that needs to awaken in the sleeping adept the Self-Realization that awaits one who says good-bye to the skandhic-apparatus and wholeheartedly embraces the inmost-core that is already enlightened. Yea, this is the passive-intuition of our inmost Self—the passive Contemplation that is devoid of discursive reasoning and meditation and of all inferior images. It is the Imageless Initiative par excellence. In time one becomes indifferent to one’s lower-self and even all spiritual ambitions. This is the apparent contradiction of the Illuminative Way that involves an En-Darkening of all exterior and even semi-interior modes of being and a direct-enlightening of the Self in the Unborn Mind. One need never feel somehow inferior or even guilty about simply resting serene and unperturbed in the Unborn. Although, after some limited effort one may even feel a retreating back into conventional modes of meditation and old spiritual habits. Some may even condemn such adepts as “quietists”. Yet, there is a major difference. Whereas the True Contemplative empties everything in order to rest unhindered in the Unborn, the quietist empties oneself in an utter vacuum of nothingness and narcissistic seclusion. The True Contemplative is never a blank-mind, but rests in the utter-fullness of the Unborn. Yea, quietism is the dullness of the tomb, whereas Recollective Stillness is the apex of kindred-love in the Unborn. Above all a True Contemplative is never a materialist or sensationalist. Rather one is of a sober-mentality and even an obscurity in the eyes of the world. Soon we shall be extracting the essence in Light of the Unborn of two major Spiritual Treatises that bespeak this Noble Contemplative journey: The Ascent of Mount Carmel and the Dark Night of the Soul. They deal with a twofold purification: the former with the dark night of the senses—a purification of exterior and even superficial interior skandhic factors; and the latter with the dark night of the spirit, which purifies the interior-self that is contaminated with even more abysmal things from the alaya-receptacle. Although the former entails great determined effort on the part of the adept, John of the Cross would concur that the latter is even more terrifying as it strips-clean even all support mechanisms in this great initiative—a feeling of truly being Alone in the void and Empty even of Self. It must also be recognized that “forgery” is a modern notion. Like Plotinus and the Cappadocians before him, Dionysius does not claim to be an innovator, but rather a communicator of a tradition. Adopting the persona of an ancient figure was a long established rhetorical device (known as declamatio), and others in Dionysius’ circle also adopted pseudonymous names from the New Testament. Dionysius’ works, therefore, are much less a forgery in the modern sense than an acknowledgement of reception and transmission, namely, a kind of coded recognition that the resonances of any sacred undertaking are intertextual, bringing the diachronic structures of time and space together in a synchronic way, and that this theological teaching, at least, is dialectically received from another. Dionysius represents his own teaching as coming from a certain Hierotheus and as being addressed to a certain Timotheus. He seems to conceive of himself, therefore, as an in-between figure, very like a Dionysius the Areopagite, in fact. Finally, if Iamblichus and Proclus can point to a primordial, pre-Platonic wisdom, namely, that of Pythagoras, and if Plotinus himself can claim not to be an originator of a tradition (after all, the term Neoplatonism is just a convenient modern tag), then why cannot Dionysius point to a distinctly Christian theological and philosophical resonance in an earlier pre-Plotinian wisdom that instantaneously bridged the gap between Judaeo-Christianity (St. Paul) and Athenian paganism (the Areopagite)? (Pseudo Dionysius the Areopagite (Stanford Encyclopedia of Philosophy). John of the Cross embellished (even surpassed) upon the Areopagite’s formulations of the Dark nature of Divinity and Mystical Theology into a spirituality of direct union with the (Absolute) Godhead that is unsurpassed even to this day and age. The journey ahead is an arduous yet a necessary one as Right Acsesis offers the best discipline in transcending the skandhic-stranglehold into the undefiled Light of the Unborn. This entry was posted in Ascending the Noble Mountain of Primordial Perfection, Spirituality and tagged Absolute Contemplation, Active Contemplation, Actual Self, apophatic way, Ascent of the Mount, Ascesis, Dark Night, Dark Night of the Senses, dark night of the spirit, declamatio, ehipassiko, En-Darkening, eremitical-monastic lifestyle, Illuminative Way, Infused Contemplation, intuitive darkness, John of the Cross, Noble Truths, Pseudo Dionysius the Areopagite, quietism, Real Recollection, Right Acsesis, Right Analysis, Right Conduct, Right Contemplation, Right Discernment, Right Gnosis, Yathabhutam. Bookmark the permalink. I am very excited for this new series, this post gave me a lot of advice with regards to my own practice, so now i ask in an effort to clarify. My meditations have reached a point where I am not sure what to do. Sometimes, I wonder if i should first build up concentration (by meditation) and then from a height of concentration, attempt to forgo all impediments. Other times, I am able to seemingly remain still, not clinging or grasping at any passing thought. When this occurs I sometimes wonder if perhaps there is no need to build up to a specific state of concentration, and instead simply should rest in this peaceful and serene state of mind. I would say, being completely honest with myself. The first sign, provided by John of the Cross, has been experienced. There was a time where meditation would result in a growth, an expansion within and the accompanying insights really transformed my world view. The second sign, has also been experienced in that before, there was this constant tug of war within my mind. I could feel the mind attempting to artificially create an “absolute” to “bond” with. Over time however, this has stopped and now those fleeting and ignorant thoughts, born of delusion, have ceased. It has reached a point where there are no delusional thoughts that bounce around, especially with regards to duality. There are only thoughts as pertaining to the Dharma, such as a thought about a concept of the dharma and the way it relates to a current experience. I took this as a sign of good progress, but as John of the Cross pointed out, it also came at a time where seemingly I have stopped making great leaps in growth. I am able to meditate for long periods of time, without any major effort. Is now the time to attempt this intuitive, internal contemplation? Or should I continue with concentration meditation at the beginning of my sessions and then afterwards attempt to rest, clear of all phenomenal outflows? At the moment, it seems my meditations mainly consist of me not grasping or clinging to any notion whatsoever, having fully realized that all appearances that are perceived through sensory consciousness are empty and without self-nature; in this i mean that they are inadequate representations of the absolute and there is no internal drive to cling to them, in fact there is a drive to let them go and not cling to the slightest of delusional thought regarding the current experience. My problem lies that I do not know if this is sitting in that void-space wherein you said quietism leads, however it feels like attempting to build up concentration feels a little wasted because by remaining prior to the breath and staying there, aside from the sensations associated with bliss, rapture, and equanimity. I do not feel the struggle to maintain the concentration and in some ways I cannot tell if my concentration was lacking to the point that this was needed or if i could skip this and attempt to cultivate this intuitive contemplation. Sorry for such a long post, I just wanted to articulate my question as best as possible. Looking forward to your response. I have read practically everything on this blog, it has been an incredible support throughout my practice as well as a humbling and continuous reminder of the journey ahead, the big picture and the goal of buddhahood. I suggest for the present that you continue in your present meditations. As this series progresses, if you feel that something resonates, then attempt gradually the Infused-Contemplation. Trust me, if it begins to click then the discursive meditations/concentrations will subside by themselves. Thank you so much for your swift response! I will take your advice and continue on as I have been. I look forward to this series and hope it helps with my cultivation of this intuitive contemplation.